He was discharged from the Marine Corps in 1946, and returned to the Dodgers organization as a catcher with the Newport News Dodgers of the Piedmont League, batting .278 in 129 games as they won the league championship; his teammates included first baseman and future film and television star Chuck Connors. Called up to Brooklyn the following year, he played as a catcher in 1947, joining the team's nucleus of Jackie Robinson, Pee Wee Reese and Carl Furillo, however, with the emergence of Roy Campanella behind the plate, Hodges was shifted by manager Leo Durocher to first base. Hodges' only appearance in the 1947 World Series against the New York Yankees was as a pinch hitter for pitcher Rex Barney in Game seven; he struck out. As a rookie in 1948, he batted .249 with eleven home runs and seventy RBIs. On June 25, 1949, he hit for the cycle on his way to his first of seven consecutive All-Star teams. For the season, his 115 RBI ranked fourth in the NL, and he tied Hack Wilson's 1932 club record for right-handed hitters with 23 home runs. Defensively, he led the NL in putouts (1,336), double plays (142) and fielding average (.995). Facing the Yankees again in the 1949 Series, he batted only .235 but drove in the sole run in Brooklyn's only victory, a 1–0 triumph in game two. In game five, he hit a two out, three-run homer in the seventh to pull the Dodgers within 10–6, but struck out to end the game and the Series. On August 31, 1950 against the Boston Braves, he joined Lou Gehrig as only the second player since 1900 to hit four home runs in a game without the benefit of extra innings; he hit them against four different pitchers, with the first coming off Warren Spahn. He also had seventeen total bases in the game, tied for third in MLB history. A great fan favorite in Brooklyn, he was perhaps the only Dodgers regular never booed at their home park, Ebbets Field. Fans were very supportive even when Hodges suffered through one of the most famous slumps in baseball history: after going hitless in his last four regular-season games of 1952, during the 1952 World Series against the Yankees, Hodges went hitless in all seven games, finishing the Series 0-for-21 at the plate, and Brooklyn lost the series in seven games. When his slump continued into the following spring, fans reacted with countless letters and good-luck gifts, and one Brooklyn priest – Father Herbert Redmond of St. Francis Roman Catholic Church – told his flock: "It's far too hot for a homily. Keep the Commandments and say a prayer for Gil Hodges." Hodges began hitting again soon afterward, and rarely struggled again in the World Series. 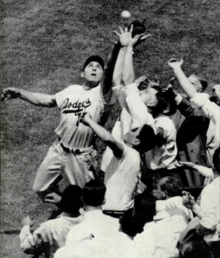 Hodges was involved in a blown call in the 1952 World Series. In the fifth game, Johnny Sain, batting for the Yankees in the 10th inning, grounded out, as ruled by first base umpire Art Passarella. The photograph of the play, however, shows Sain stepping on first base while Hodges, also with a foot on the bag, reaches for the ball, which was about a foot away from his glove. Baseball commissioner Ford Frick, an ex-newspaperman himself, refused to defend Passarella. He ended 1953 with a .302 batting average, finishing fifth in the NL in RBI (122) and sixth in home runs (31). Against the Yankees in the 1953 Series, Hodges hit .364; he had three hits, including a homer in the 9-5 Game 1 loss, but the Dodgers again lost in six games. Under their new manager Walter Alston in 1954 Hodges set the team home run record with 42, hitting a career-high .304 and again leading the NL in putouts (1,381) and assists (132). He was second in the league to Ted Kluszewski in home runs and RBI (130), fifth in total bases (335) and sixth in slugging (.579) and runs (106), and placed tenth in the MVP vote. After 11 games with the Mets in 1963, during which he batted .227 with no homers and was plagued by injuries, he was traded to the Washington Senators in late May for outfielder Jimmy Piersall so that he could replace Mickey Vernon as Washington's manager. Hodges immediately announced his retirement from playing in order to clearly focus on his new position. The Giants' Willie Mays had passed him weeks earlier on April 19 to become the NL's home run leader among right-handed hitters; Hodges' last game had been on May 5 in a doubleheader hosting the Giants (who had moved to San Francisco in 1958). Hodges managed the Senators through 1967, and although they improved in each season they never achieved a winning record. One of the most notable incidents in his career occurred in the summer of 1965, when pitcher Ryne Duren – reaching the end of his career and sinking into alcoholism – walked onto a bridge with intentions of suicide; his manager talked him away from the edge. In 1968 Hodges was brought back to manage the perennially woeful Mets, and while the team only posted a 73–89 record it was nonetheless the best mark in their seven years of existence up to that point. In 1969, he led the "Miracle Mets" to the World Series championship, defeating the heavily favored Baltimore Orioles; after losing Game 1, they came back for four straight victories, including two by 2–1 scores. Finishing higher than ninth place for the first time, the Mets became not only the first expansion team to win a World Series, but also the first team ever to win the Fall Classic after finishing at least 15 games under .500 the previous year. Hodges was named The Sporting News' Manager of the Year, in skillfully platooning his players, utilizing everyone in the dugout, keeping everyone fresh. In the third inning of the second game of a July 30 doubleheader against the Houston Astros, after scoring 11 runs in the ninth inning of the first game, the Astros were in the midst of a ten-run third inning, hitting a number of line drives to left field. When the Mets' star left fielder Cleon Jones failed to hustle after a ball hit to the outfield, Hodges removed him from the game, but rather than simply signal from the dugout for Jones to come out, or delegate the job to one of his coaches, Hodges left the dugout and slowly, deliberately, walked all the way out to left field to remove Jones, and walked him back to the dugout, which was a resounding message to the whole team. For the rest of that season, Jones never failed again to hustle. Kiner retold that story dozens of times during Mets broadcasts, both as a tribute to Hodges, and as an illustration of his quiet but disciplined character. On the afternoon of April 2, 1972, Hodges was in West Palm Beach, Florida completing a round of golf with Mets coaches Joe Pignatano, Rube Walker and Eddie Yost when he collapsed en route to his motel room at the Ramada Inn across the street from Municipal Stadium, then the home of the Atlanta Braves and Montreal Expos. Hodges had suffered a sudden heart attack and was rushed to Good Samaritan Hospital where he died within 20 minutes of arrival. Pignatano later recalled Hodges falling backwards and hitting his head on the sidewalk with a "sickening knock", bleeding profusely and turning blue. Pignatano said "I put my hand under Gil's head, but before you knew it, the blood stopped. I knew he was dead. He died in my arms." A lifelong chain smoker, Hodges had suffered a minor heart attack during a September 1968 game. The entire baseball community was horribly shocked and totally devastated at the sudden loss of one of baseball's most beloved players. A symbol of Brooklyn, many former teammates grieved at the loss of Hodges. Jackie Robinson, himself ill with heart disease and diabetes, told the Associated Press, "He was the core of the Brooklyn Dodgers. With this, and what's happened to Campy (Roy Campanella) and lot of other guys we played with, it scares you. I've been somewhat shocked by it all. I have tremendous feelings for Gil's family and kids." Robinson himself died of a heart attack only six months later on October 24, 1972 at age 53. The wake was held at Our Lady Help of Christians Church in Midwood, Brooklyn on April 4, what would have been Hodges' 48th birthday. It was later estimated approximately 10,000 mourners had attended. Hodges was survived by his wife, the former Joan Lombardi (born 1926 in Brooklyn), whom he had married on December 26, 1948, and their children Gil Jr. (born March 12, 1950), Irene, Cynthia and Barbara. He is buried at Holy Cross Cemetery in East Flatbush, Brooklyn. Hodges received New York City's highest civilian honor, the Bronze Medallion, in 1969. On April 4, 1978 (what would have been Hodges' 54th birthday), the Marine Parkway Bridge, connecting Marine Park, Brooklyn with Rockaway, Queens, was renamed the Marine Parkway–Gil Hodges Memorial Bridge in his memory. Other Brooklyn locations named for him are a park on Carroll Street, a Little League field on Shell Road in Brooklyn, a section of Avenue L and P.S. 193. In addition, part of Bedford Avenue in Brooklyn is named Gil Hodges Way. 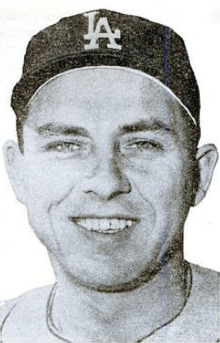 A Brooklyn bowling alley, Gil Hodges Lanes, is also named after him. Hodges was also inducted into the New York Mets Hall of Fame in 1982. 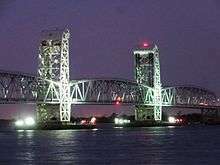 In Indiana, the high school baseball stadium in his birthplace of Princeton and a bridge spanning the East Fork of the White River in northern Pike County on State Road 57 bear his name. In 2007, Hodges was inducted into the Marine Corps Sports Hall of Fame. A Petersburg Little League baseball team also bears his name, Hodges Dodgers. Hodges was the prototype of the modern slugging first baseman, and while the post-1961 expansion era has resulted in numerous players surpassing his home run and RBI totals, he remains the only one of the 21 players who had 300 or more home runs by the time of his retirement who has not yet been elected (all but Chuck Klein and Johnny Mize were elected by the BBWAA). Some observers have also suggested that his death in 1972 removed him from public consciousness, whereas other ballplayers – including numerous Dodger greats – were in the public eye for years afterward, receiving the exposure which assist in their election. He did, however, collect 3,010 votes cast by the BBWAA during his initial eligibility period from 1969 to 1983 – 2nd place for an unselected player, he was passed by Jack Morris in 2014 when he collected 351 votes to push his total to 3,324. Hodges who was regularly considered for selection by the Hall of Fame's Veterans Committee since 1987, falling one vote short of election in 1993, when no candidates were selected. A 52 ft.x16ft. mural was dedicated in Hodges' hometown of Petersburg, Indiana in 2009; it was painted by artist Randy Hedden and includes pictures of Hodges as Brooklyn Dodger, manager of the New York Mets, and batting at Ebbets Field. The mural, located at the intersection of state highways 61 and 57, is meant to "raise awareness of Hodges' absence from the Baseball Hall of Fame." ↑ "Current and Former Players with Note Regarding Their Names". Baseball-Reference.com. ↑ "Page 2's List for top upset in sports history". ESPN. ↑ Bill Robertson. "Gil Was Grid Hero, too... for One Day". ↑ "1947 World Series, Game Seven". Baseball-Reference.com. October 6, 1947. ↑ "1949 World Series, Game Two". Baseball-Reference.com. October 6, 1949. ↑ "1949 World Series, Game Five". Baseball-Reference.com. October 9, 1949. ↑ Oliphant, Thomas (2005). 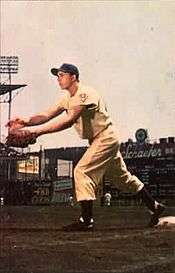 Praying For Gil Hodges. United States: Thomas Dunne Books. ISBN 0-312-31761-1. ↑ "Today we visit a few giants". The New York Daily News. December 7, 2008. Retrieved October 25, 2012. 1 2 "Gil Hodges Dies of Heart Attack". The Victoria Advocate. Associated Press. April 3, 1972. Retrieved October 25, 2012. 1 2 3 4 5 6 7 8 9 10 11 12 13 Clavin, Tom; Danny Peary (2012). Gil Hodges: The Brooklyn Bums, the Miracle Mets, and the Extraordinary Life of a Baseball Legend. New York: New American Library. pp. 359–361, 370–375. ISBN 978-0-451-23586-2. ↑ Durso, Joseph (September 26, 1968). "Hodges, Stricken by Mild Heart Attack, Expected to Rejoin Mets by Spring". The New York Times. p. 65. Retrieved 2011-09-03. 1 2 3 4 5 Bloom, Barry M. (November 3, 2011). "Santo, Hodges among 10 on Golden Era ballot". MLB.com. Retrieved November 11, 2011. ↑ Rogers, Phil (December 5, 2011). "Cubs icon Santo elected to Hall of Fame". The Chicago Tribune. Retrieved October 25, 2012. ↑ Ethridge, Tim (May 6, 2009). "Petersburg honors Gil Hodges with mural". The Courier Press. Retrieved October 25, 2012. Milton J. Shapiro. The Gil Hodges Story (1960). Gil Hodges and Frank Slocum. The Game Of Baseball (1969). Marino Amaruso. Gil Hodges: The Quiet Man (1991). Tom Oliphant. Praying for Gil Hodges: A Memoir of the 1955 World Series and One Family's Love of the Brooklyn Dodgers (2005) ISBN 0-312-31761-1.